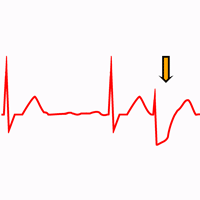 Ashman phenomenon is an aberrant ventricular conduction that follows a short R-R interval preceded by a long R-R interval. It is a physiological aberrancy and is typically seen in Atrial Fibrillation, but it can also be seen in Atrial Tachycardia or in premature supraventricular beats. Gouaux and Ashman reported that in Atrial Fibrillation, when a relatively long cycle was followed by a relatively short cycle, the beat with a short cycle often has Right Bundle Branch Block morphology 1. This phenomenon may cause diagnostic confusion with premature ventricular complexes because it is seen on the EKG as a single wide QRS complex during Atrial Fibrillation with narrow QRS complexes. Single, wide QRS aberrant complexes are caused almost exclusively by the Ashman phenomenon 2. Ashman phenomenon is caused by a prolonged refractory period of the His-Purkinje system due to a long R-R interval of the preceding cycle. When a supraventricular premature stimulus reaches the His-Purkinje system while one of its branches is still in the relative or absolute refractory period, this results in blocked conduction through one bundle, causing on the electrocardiogram a QRS complex with Bundle Branch Block morphology 3. Because the refractory period of the right bundle branch is longer than the left one, a Right Bundle Branch Block pattern is more common. The RBBB pattern may be associated with Left Fascicular Blocks 4. Wide QRS complexes (red arrows) after a short R-R interval preceded by a long R-R interval. On the Electrocardiogram Ashman phenomenon will present as a long R-R cycle followed by a short R-R terminated by the aberrant QRS complex. The QRS complex has Bundle Branch Block morphology. The RBBB pattern is more common. A relatively long R-R cycle immediately preceding the short R-R cycle terminated by the aberrant QRS complex. A short-long-short R-R interval is even more likely to initiate aberration 4. Right Bundle Branch Block pattern is more common, but LBBB or both may be observed even in the same patient. The degree of aberrancy may vary 2. Concealed perpetuation of aberration is possible, such that a series of wide QRS supraventricular beats is possible 4. Absence of a fully compensatory pause (common in Premature Ventricular Complexes) . The presence of the long-short sequence that ended in a wide QRS complex and, above all, the short-long-short sequence favors the diagnosis of Ashman Phenomenon. The absence of this sequence excludes Ashman Phenomenon and therefore aberrancy. If the wide QRS complex is preceded by a P wave indicates that the beat is supraventricular. A regular coupling of wide QRS complex favors the diagnosis of Premature Ventricular Complexes. The presence of fully compensatory pause favors its ventricular origin, while the absence of a compensatory pause is more likely to be aberrancy. Polymorphism, particularly that manifested by various forms of Right Bundle Branch Block, favors Ashman Phenomenon 2. Ashman phenomenon does not cause symptoms and does not need medical treatment. Its principal clinical meaning is the electrocardiographic manifestation of a rhythm disorder responsible for fluctuations in Heart Rate. Treatment should be directed at the rhythm disorder 5. Ashman phenomenon is a physiological aberrancy of the ventricular conduction, typically seen in Atrial Fibrillation as a result of sudden fluctuations in heart cycle, causing a bundle branch block. On the Electrocardiogram Ashman phenomenon will present a long cycle immediately preceding a short cycle terminated by an aberrant complex. The most common morphology is Right Bundle Branch Block pattern. This phenomenon may cause diagnostic confusion with premature ventricular complexes. The diagnosis is mainly based on the presence of the long-short sequence that ended in a wide QRS complex without compensatory pause. 4. Fisch C. Electrocardiography of arrhythmias: from deductive analysis to laboratory confirmation--twenty-five years of progress. J Am Coll Cardiol. 1983 Jan. 1(1):306-16. 5. Alraies MCh, Eisa N et al. The Long and Short of It: Ashman’s Phenomenon. Am J Med. 2013 Nov;126(11):962-3.